Kilworth (Gaelic: Cill Úird) is a small village in North Cork. The name Kilworth comes from Irish (Gaelic) 'Cill Úird', literally meaning 'Church of the order'. Kilworth was the scene of some battles in the war of 1641 and during the usurpation of Cromwell, by whom the manor was given to Fleetwood, whose name it still bears. In July, 1642, the castle of Cloghlea, on the banks of the river Funcheon, near the town, said to have been built by the family of the Condons, and at that time the property of Sir Richard Fleetwood, was taken by Lord Barrymore and the custody of it entrusted to Sir Arthur Hyde, from whom it was afterwards taken by a descendant of the original founder, who surprised the garrison and either put them to death or detained them prisoners. Those who heard him say his fingers were miraculous. His astonishing technical prowess contributed to an important evolution in Highland pipe technique in the early part of the twentieth century. As a composer, the quality and lasting appeal of his tunes are unequalled. As a person he was modest, generous and well-liked by his peers. But on the strength of his light music playing alone his name would almost certainly be included in lists of the top three pipers ever. He was born in Edinburgh in 1883 to a leading and long-standing piping family and would die in his prime at age 46 in 1929 with his only book of music just off the presses. While most in the family spelled the name “MacLennan,” it appeared that G. S.’s immediate family, starting with his father, spelled it “McLennan.” The birth and death certificates both use the spelling ‘McLennan.’ In fact, the name on G. S.’s birth certificate is “George Charles Stewart McLennan,” the result of his parents naming an earlier child who was born and died in 1881 “George Stuart McLennan.” This renaming practice was common among Victorians, who frequently suffered child loss. The name “Charles” does not appear on G. S. McLennan’s death certificate. 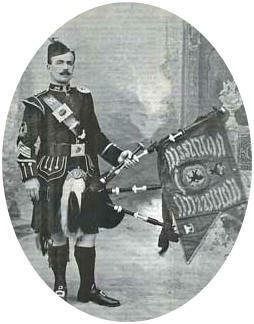 His father, Lieutenant John McLennan, was a recognized and outspoken authority on bagpipe music with views on piobaireachd which some contemporaries considered radical. A stern critic of the early Piobaireachd Society, his later reputation suffered accordingly. He would produce two books of music later in his life: Piobaireachd as MacCrimmon Played It (1907) and The Piobaireachd As Performed in the Highlands for Ages till about the Year 1808, which would be published in 1924, after his death. G. S. served in the trenches late in the First World War. On May 14, 1918 he became ill. Two days later he played ‘A' Company over the top and the next day collapsed with sickness. It was an illness that would never leave him. But he returned to duty and began making reeds in the trenches for fellow pipers. He was discharged from the Gordons in 1922. Due to his Gordons connection, G. S. made Aberdeen his home. After his discharge he set up a pipe-making business there, a trade he plied until his untimely passing in 1929. Some of his chanters and pipes still survive. He continued to compete up until 1926 when he won his final event: the Former Winners’ M/S/R at Inverness, for the third time.